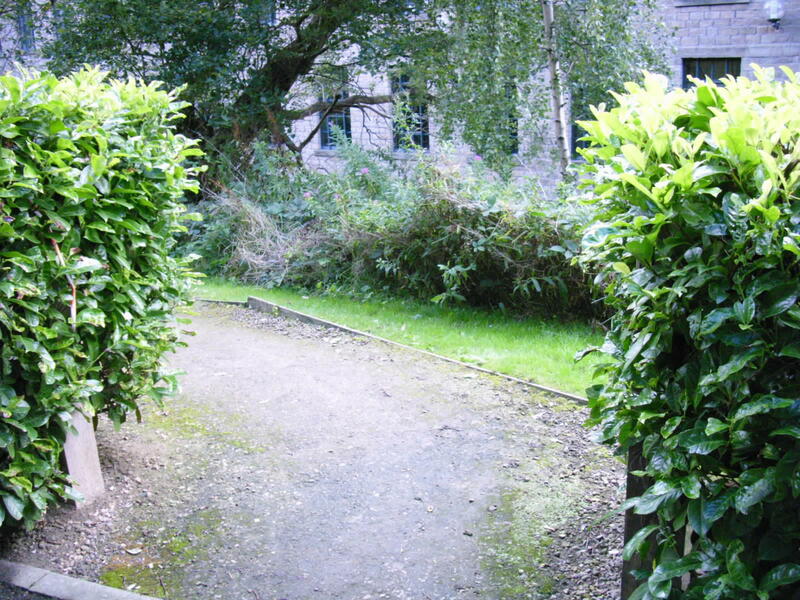 I’m currently embarking on a new journey – one that seeks to navigate a way through the woods of ‘academia’. Having been teaching now for 6 years, the word has sat quietly on my shoulder whispering of its prowess and stature, yet I’ve struggled to find a straight answer with regards to how to begin to find my way through its seemingly impenetrable mass of trees. In taking up a new post at Staffordshire University earlier this year, I was determined to conquer it and with some research under my arm and a tactile approach to pedagogy in tow I set off hoping to meet a guide along the way. Alke has kindly invited me to contribute to this online space, and I find myself at the first stop on my map. 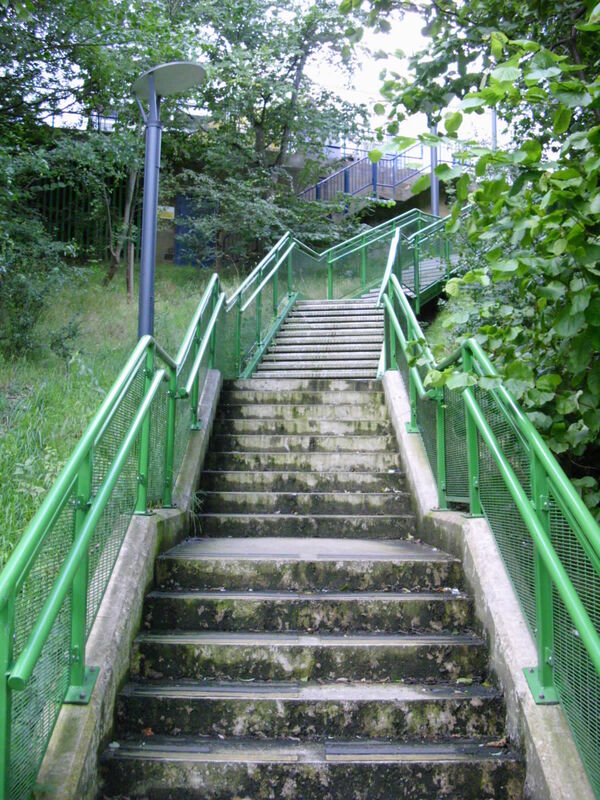 I’ve shared this small anecdote with you all in the hope of encouraging those new to the academic landscape – it’s simply a case of one step at a time! In 2014 I completed a pedagogic research project on the MA Graphic Design course at London College of Communication. The research discusses a tactile, visual metaphor for an increasingly prevalent issue within art and design education, culminating in a series of practical workshops entitled ‘The Non-Linear Workshop Series’. Beyond digital technology: introducing undergraduate graphic design students to the non-linear landscape of the creative process. Many undergraduate graphic design students struggle to explore the landscape of the creative process in a ‘non-linear’ way, due to the dominance of digital technology on their life thus far, which increasingly encourages a ‘linear’ mode of thought. A) Brief to B) Solution (via Google). In my research question, I have used the word ‘landscape’ as it means ‘all the visible features of an area’, or ‘the distinctive features of a particular situation or activity’. Many entry-level students are blind to the ‘visible or distinctive’ features of the non-linear creative process, and unaware of the options with regards to how and why they should traverse its landscape. They have grown up in an age of linear immediacy — of the digital Google map that tells them where to go. The Non-Linear Workshop Series uses a physical landscape as a metaphor for the exploration of this idea. In addition, I have used the phrase ‘beyond digital technology’ with the intention of suggesting ‘more than, exceeding, in excess of, above, over and above, above and beyond, upwards of’ as opposed to ‘on the other side of, further away than, behind, past, after or over’. I recognise the value of the Internet as a research tool, yet the Non-Linear Workshops Series aims to teach students to know how to ‘go beyond’ it. 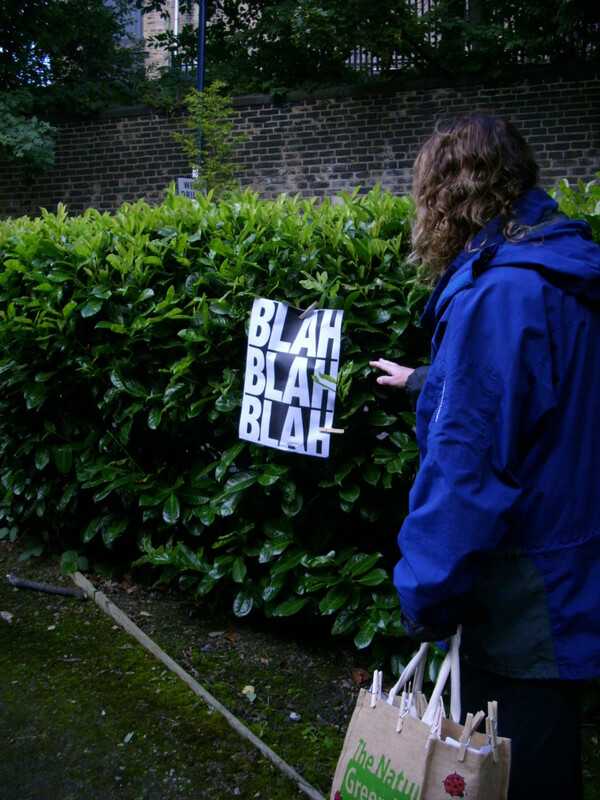 The Non-Linear Workshop Series presents ‘A) Brief, to B) Solution’ as a visual, tactile, focal point, and encourages undergraduate graphic design students to question and explore how exactly they traverse from A to B, along with what their journey might look like in relation to ‘linear’ or ‘non—linear’ form. The first aspect of the workshop series introduces the students to the context of the research in an appropriate, simplified manner through the group discussion of a short text and series of questions. The students are able to grasp and engage in the research proposition easily through this method, enabling them to ‘want’ to learn more through realising a ‘need’ to engage in the subject matter. The second aspect of the workshop series enables students to begin to unpick and understand the meaning of ‘non-linear’. The workshop begins with a brief whereby students write down their initial understanding of the meaning of ‘non-linear’, before investigating further. This enables the discussion of the nature of Google-led research through the drawing of a line within a given template. Formal definitions of linear and non-linear are then provided to conclude the session. The third aspect of the workshop series asks students to generate varying forms of line during a 1 day workshop. Students use varying tools and mark making methods to do this. The lines generated provide further visual impetus through which to discuss the development of their understanding of the differences between ‘linear’ and ‘non-linear’. 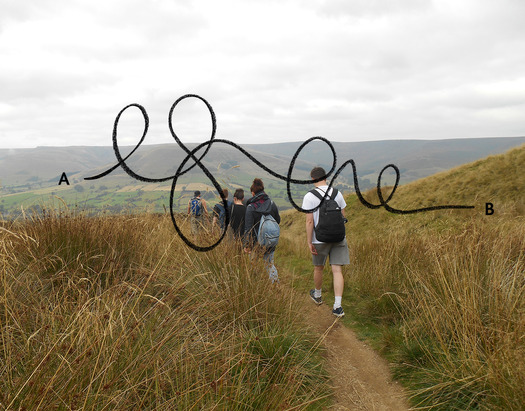 The fourth aspect of the workshop series asks students to map 5 different routes on an OS map, through which they begin to explore an unfamiliar, local landscape. The aim of this brief is to generate non-linear visual form in a way that directly corresponds to a physical landscape. These forms are then extracted from the maps and digitised so as to provide further, clear visual impetus to reinforce the context and increasing understanding of the research context. This activity also provides students with a route to follow during the next workshop. 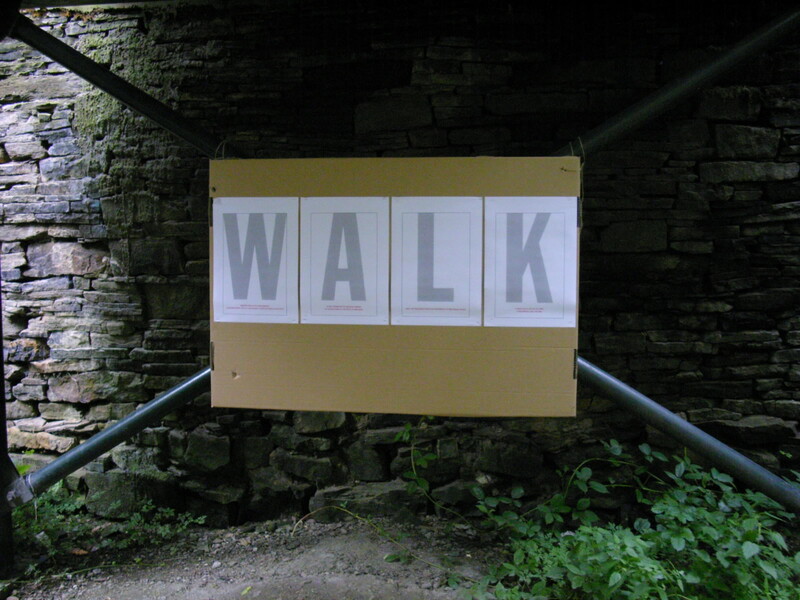 The fifth aspect of the workshop series involves a field trip to an unfamiliar local landscape. 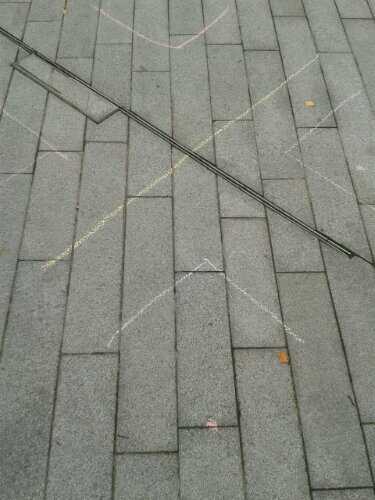 The route that the students follow will be chosen from the previous session where varying non-linear routes are mapped. A design brief is provided at the start of the field trip which asks the students to represent the landscape in 5 different visual ways. 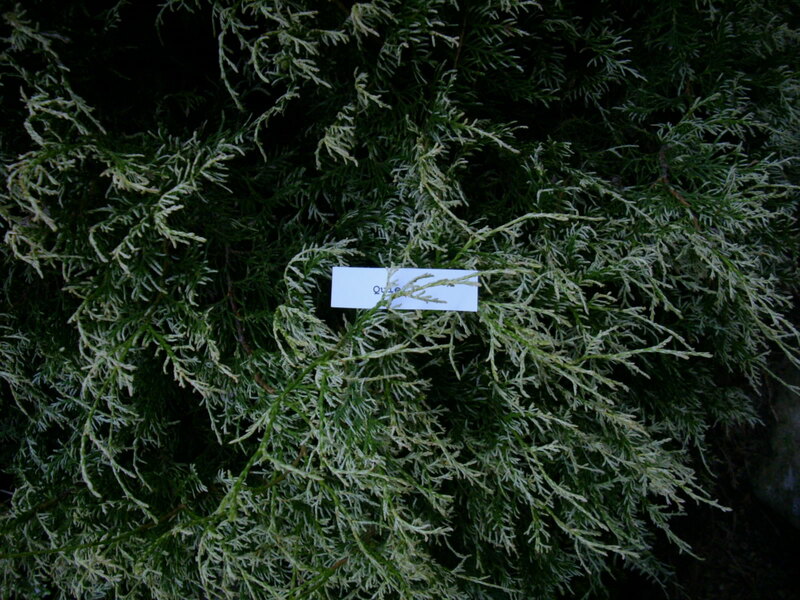 They are asked to document the landscape as they walk their elected route in consideration of their 5 senses — sight, touch, smell, taste and sound. The sixth aspect of the workshop series asks students to develop a visual response to the material that they sourced and documented during the Landscape trip. The length of this workshop will vary dependent on institutional structure, unit/module requirements and the needs of the student group. The output work produced acts as impetus for discussion surrounding the ‘non-linear’ landscape of the creative process – as experienced in a physical, tangible manner. The seventh aspect of the workshop series involves a final group crit of work produced in the previous session(s) so as to enable the students to both see and reflect on each other’s work critically. The work produced will also act as impetus when the students repeat one of the earlier briefs whereby they draw a line that they feel represents the creative journey they have taken in representing a physical landscape creatively. 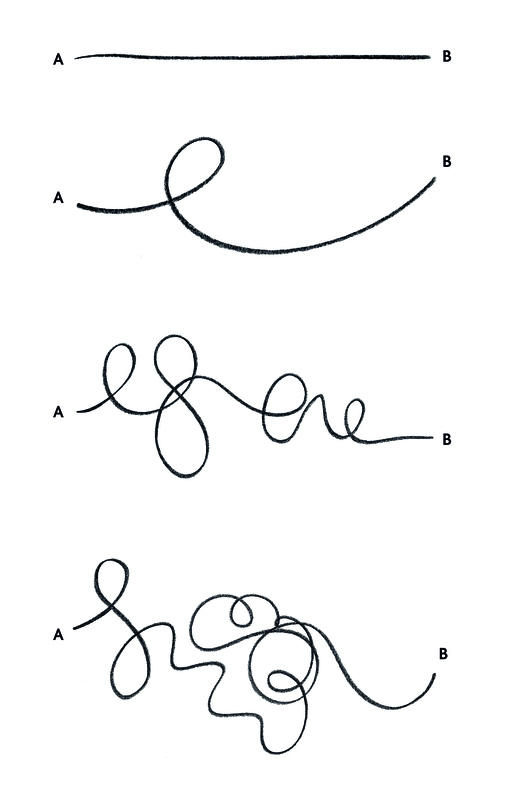 The drawing of this line, in comparison to their earlier ‘30-minute Google’ line will instigate discussion concerned with its change in form from straight to more complex, enabling the students to evaluate and reflect on the workshop series in relation to the development of their personal working methods. Each student will also receive a visual template for future projects through which they are able to apply what they have learnt through drawing the ‘linear’ or ‘non-linear’ nature of their creative process on any given brief. Throughout the academic year 15/16 I will be seeking to continue to test and develop the Non-Linear Workshop Series with the aim of disseminating it to HE art & design lecturers for potential use. For references please check the Bibliography page. 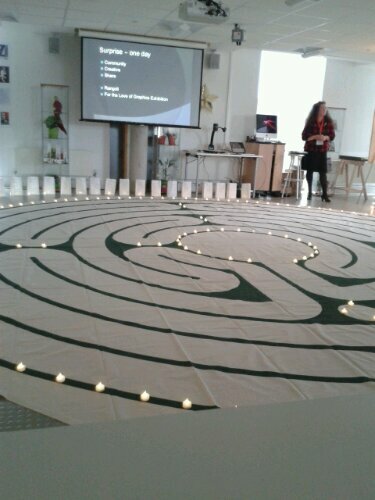 Last week I was lucky enought to attend the Happenings & Knowledge Promenades: working cross discipline workshop at the Arts University Bournemouth. It had been promised that the workshop would explore “the value and potential of cross discipline collaborative activities and the dynamism of the Happening and the ‘knowledge promenade’ in learning and teaching”, and it really delivered. The graphics studio, which was to be our base for the day’s activities, had been overtaken with a large labyrinth on a floor cloth augmented with little electronic tea lights, and we were invited to walk this art work at any time of the day – as long as we didn’t take our beverages further than the christmas tree branches playfully demarking its outer edge (no drinks beyond the treeline). Hosted by Kirsten Hardie it was introduced by short Pecha Kucha presentations to set us up for a day that was built around four sessions, which explored different aspects of disruption of the traditional methods and spaces of teaching. And while each of the examples was based in a particular discipline, great care and attention was taken to get us participants started to think about the cross disciplinary potential of what we were experiencing. The order in which I ended up doing the sessions led me from the contemplative to the disruptive, which turned out to be just right for the day. I then joined Becoming through Music facilitated by Laura Ritchie, where each of the participants found themselves with a cello in one hand and a bow in the other (yes, an actual cello), learning to plug and then play some simple notes. (Note the mnemonic: Active Dreams Give Courage to remember which string is which). In the end I could play an almost recognisable rendition of Twinkle, Twinkle, Litte Star. But of course the important aspect of the session was to reflect on what it is like to be a learner yourself (something every teacher should be reminded of every once in a while), how sometimes ‘giving it a go’ can be both scary and exhilirating, and how important non-verbal communication can be (we also did some cello playing as a group). My last session of the day was Happening with Gordon Ramsey. Here we shared in groups things we had already done that could be considered disruptive – productively surprising students and introducing a new energy into traditional lecture and seminar settings. When he first briefed this, I though to myself: I haven’t done any of that!, but surprisingly once I started thinking about it, I could come up with a short-ish list… some of the stuff already documented on this blog. We then went on to consider what task we could set students that would be so memorable that they would never forget it – and again there were some interesting ideas thrown about. Unfortunately the day was over all too soon (as these events so often are). What was particularly valuable was that it allowed an insight into practices from a wide range of disciplines, all of which with the potential to be built into other disciplines (most obvious with Clive’s session, where he also shared how this has already spread from management to health). It was a memorable day that provided food for thought for a long time to come! 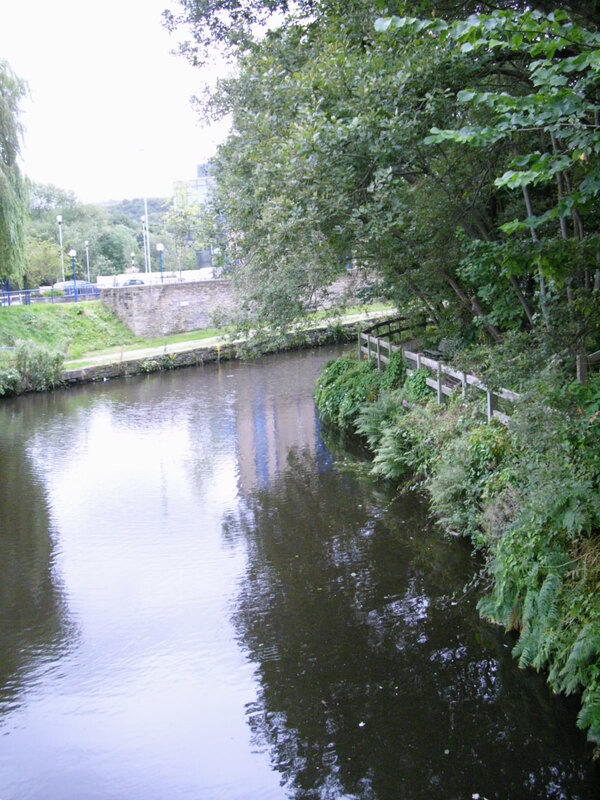 On 14th September I was lucky enough to join Sarah Williamson on a reflective walk she organised and led as part of a Teaching and Learning event at the University of Huddersfield. 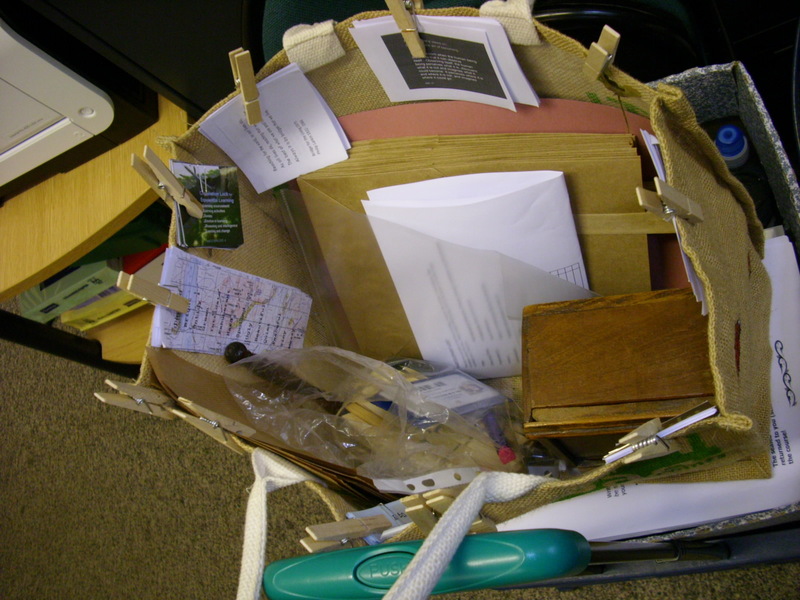 As you may know if you are a regular reader of this blog, Sarah teaches Art and Design teachers and this walk is one of the things she does with her students to remind them of the learning they have done and to encourage reflective practice. 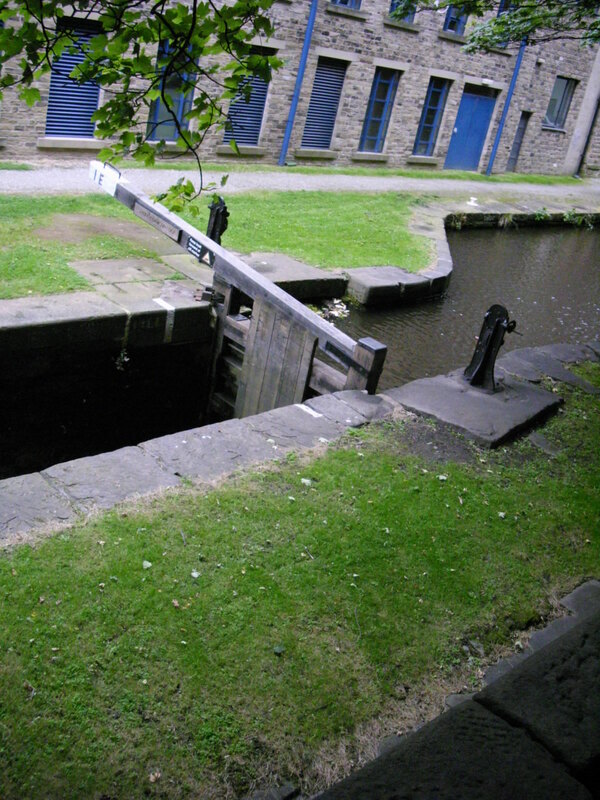 While we had a short walk to the actual beginning of the walk, once we were there, Sarah pointed out the gateway, making us aware of the idea of starting a new experience – this was not just a walk anymore, this was about us reflecting on our teaching practice. Once we had passed the gateway and turned the corner, we were greeted by a larger print-out stating BLAH BLAH BLAH, something we were to leave behind us on this walk (and hopefully in our reflection on our practice…). 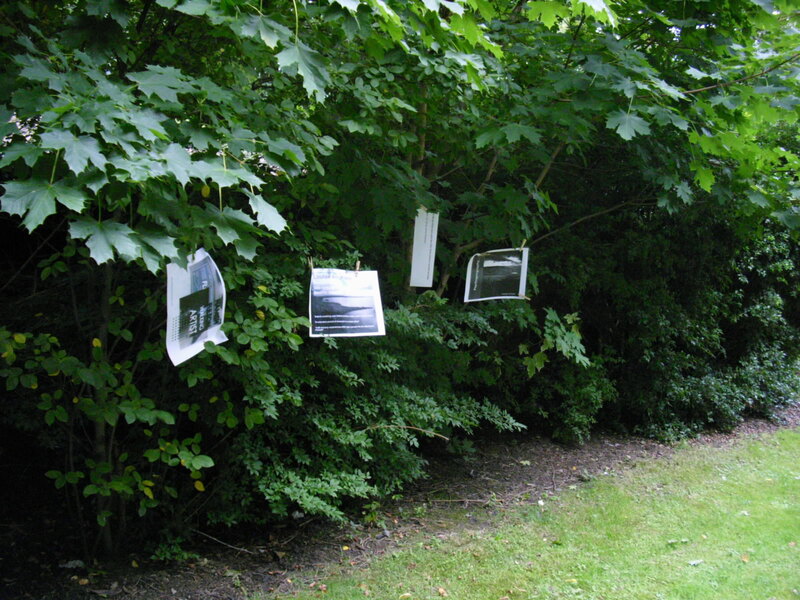 We then encountered a number of texts and quotations that had been secured to the trees and shrubs, all concerned with reflective practice and teaching – and particularly the impact that landscape and environment can have on these issues. After the first part of the walk, which could be likened to a sort of literature review, very much referencing key texts and practitioners in this area, we were warmed up and could start to think reflectively ourselves. 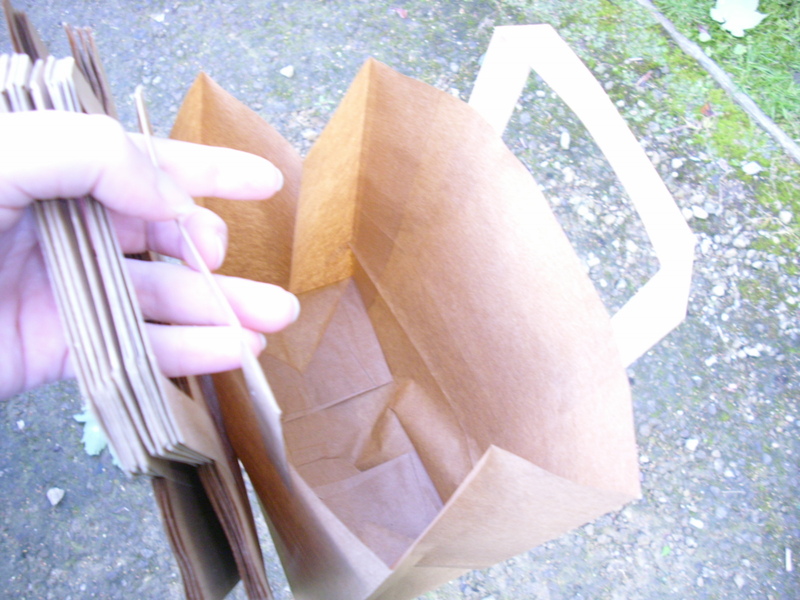 To help us with that we each got a paper bag, which would become filled with little bits and pieces along the way. We thought about describing things, how to find the right words, and how important that can be when trying to communicate something. 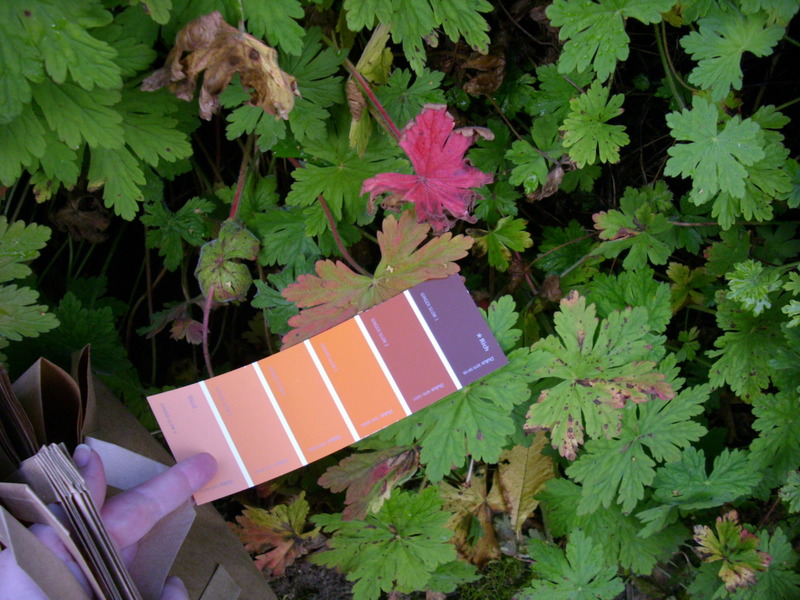 For that we each got a number of colour charts and had to find something of that exact colour. We then stepped away from the literal by matching given words with something we saw – and then explaining to another member of the group what we had found. 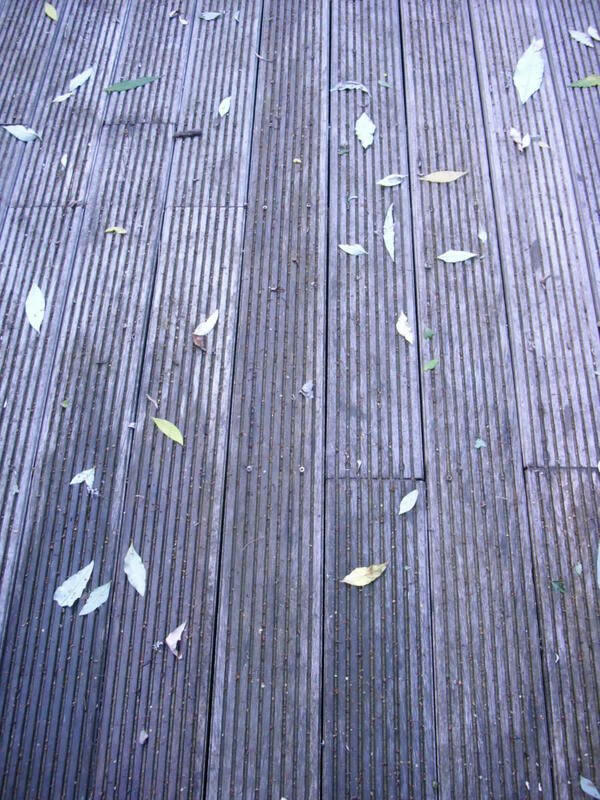 We took inspiration from the decking we encountered and thought about which ‘ridges’ were reflected in the aspirations we had to teaching. 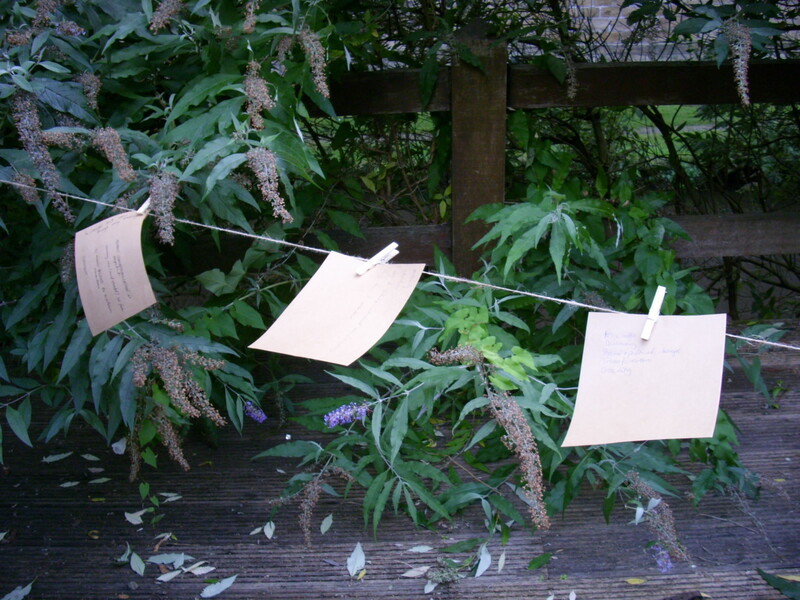 We then jotted them down on Kraft paper (also nicely striped) and pinned them up on a washing line for all to read and discuss (and as an art intervention to remain once we had passed through). Another intervention Sarah told us about she does with her students (although we didn’t have the time to do it), is looking for a found object that is a reflection of your teaching practice, explain to the group why it is so and then build it into an installation by combining it with the objects everybody else has found. 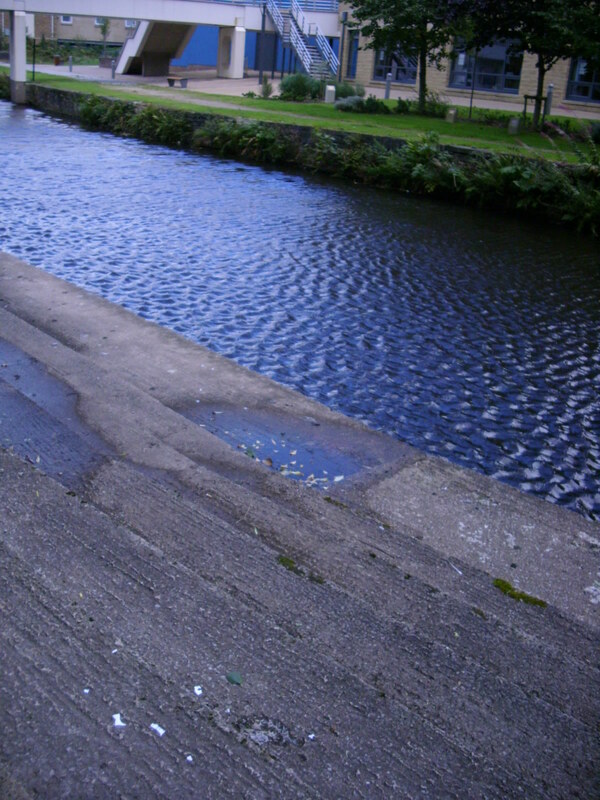 As we continued our journey down the tow path along the canal, we encountered some more art, but were also encouraged to notice things that we usually don’t – what is there and so much in the background that we often don’t even realise it, like the noise of the air conditioning units, for example. We looked at the buildings, refurbished into university buildings but still showing an industrial heritage, and thought about the history of our discipline, and how it might have changed – and what that means for our inidividual contexts. 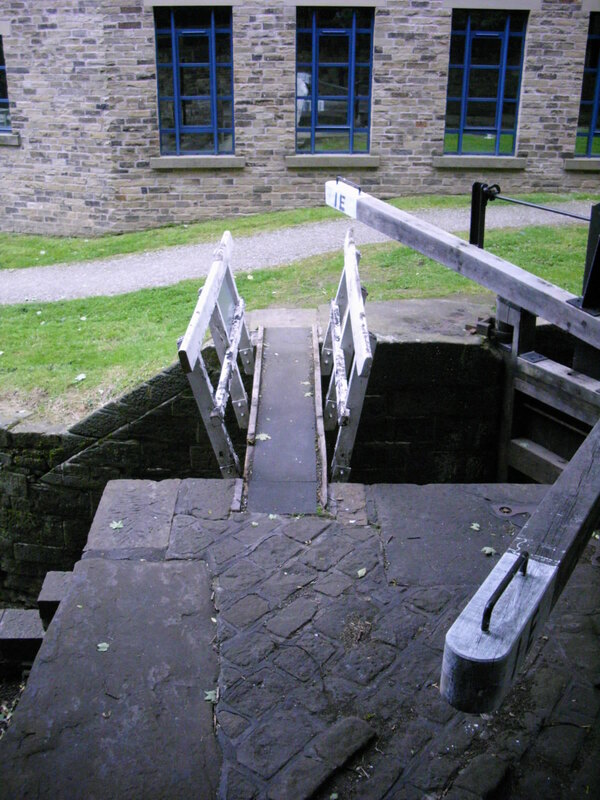 as well as the little bridge that can be seen to both keep the two apart and link them. At this stage we also thought about Beard and Wilson’s concept of the Combination Lock for Experiential Learning (2006) and their notion of the importance of integrating the environment, activities, senses and emotion into the learning experience. We came to another bridge a little while later – bridges of course a good way of thinking about linking one side with the other – maybe the practical with the theoretical, but also giving a good vantage point to looking into both the past – where have we come from in our practice, how have we developed- and future – what is around that next bend of the river, where do we want to go next? Not so far away from reflective practice, is it? I went home with so much to think about, about my own teaching, about which elements I could use to make up my own reflective walk to make students think about their practice in a more reflective way. While Sarah is very lucky to have a lovely walk just outside the building she works in, I do believe that it is possible to translate the points she was making and the activities she used to develop our/the students reflective thinking pretty much to anywhere – with a little bit of care. I’m so glad I made the trip to Huddersfield that day!